This web page was first mounted on June 13, 2011 by Sheila Schmutz. sheila.schmutz@usask.ca and last updated on July 11, 2016. This is a work in progress and any additions or corrections are welcome! This webpage focuses on the former settlement of Fish Creek on the east side the South Saskatchewan River, across from Duck Lake. A small portion of the Centennial Homestead Map by Richard D. Chomyn (2005) is shown at the left. The first date is the date the person settled there and the second date is the date the land was officially granted to them, or patented, as it was called. Most of the early settlers were Métis families. These included Ignace Poitras in 1869, Marie Vandal in 1870, and Gabriel Dumont in 1872 about 3 miles north. Settlers near Fish Creek arrived a bit later. These first families within 2 miles north or south included Joseph Delorme in 1882, the brothers Maurice and Pierre Henry in 1882, several Vandal or Vandale families and Fidler or Fiddler families in 1883, Baptiste Deschamps in 1883, Napoleon Venne in 1884, etc. A later influx of settlers after 1900 were primarily Polish immigrants. These included Frank Buniak, Nichola Kachkowski, Anton Kramczynsky, Michal Roslinksi, etc. Many Ukrainian immigrants settled in the area around Alvena, discussed on a separate webpage. 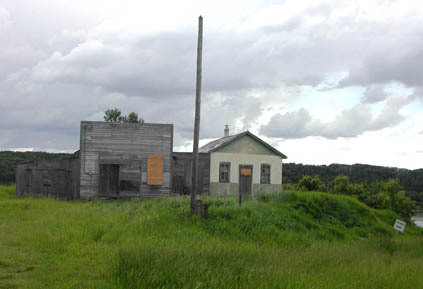 There was a post office in Fish Creek from 1906 to 1969. The Rural Municipality of Fish Creek, No. 402 was formed on February 28, 1913. The administrative office of this R.M. is in Wakaw. Prior to the R.M. 's establishment there was a Local Improvement District which was formed on July 15, 1907. The first church services in the surrounding area apparently occurred in Fort Carlton in 1838. Roman Catholic missionaries served the people of the area beginning in 1870 (Lavigne 1990). The first church in the RM of Fish Creek was part of the Métis settlement along the South Saskatchewan river. It is often reffered to as the Fish Creek Church but it's religious name was the Immaculate Conception Church. It was a Roman Catholic church, built in 1901. Prior to that, settlers went to the Catholic Church in Batoche, St. Antoine de Padoue, which had been built in 1883, for marriages and christenings and funerals. Father Brueck who was responsible for St. Patrick Orphanage in Prince Albert was sent to Fish Creek to set up the mission in 1900 (Lavigne 1990). A portion of a letter sent to his bishop is included in "Kaleidescope. Many Cultures, One Faith." Father Theodore Krist became the first resident priest. He had River Lot 12 in Township 42A. This first church was dedicated to the Immaculate Conception on December 8, 1901. Little is recorded about the original members of this church, but they were presumably all Metis. It is interesting that the first priests were German but they likely also spoke French. The original church was burnt in 1920 and a new church was built on the same site following a plan similar to the original church. The three altars of this church were built by Peter Bukowsky and his sister Wilhemina made the altar linens. In 1954, the parish became a mission of Alvena and the church was closed in 1957 (Lavigne 1990). In 1973 the land and church was sold to Joe & Olga Bazowski. He planted wheat right up to the church in the hopes of preventing vandalism. Although abandoned, it still stands on private land owned by Olga Bazowski. Single or a few burials were officiated by a few additional priests, such as Th. Tilweers in 1905, P. Minwegen 1909, J. Dudzik in 1920, S. Urbanoski in 1930, P.E. Myre 1930, A. Houl in 1931, Leo Auclair 1934, D. Dubuc in 1953. These priests were presumably from neighboring parishes or were relatives of the deceased. An associated cemetery is located about 0.5 mile east of the church, now across the road. About 85 graves are still identifiable in this cemetery, although about 15 of these do not bear a legible name. Any help identifying the persons buried in the unmarked graves is appreciated. The 85 tombstones indicate the mixed community that attended the Immaculate Conception church. Both Metis and Polish names are shown on the headstones, as well as a few Ukrainian and German. The burial records, now held in the diocese archives in Prince Albert show more names (111) than tombstones, but there are also tombstones with no burial record in the file. It is likely that early graves marked by wooden crosses are now unmarked, although two wooden crosses remain - one standing and one broken and laying on the ground, neither with a name attached. Although there are records of 22 burials in 1901 and 1902, no tombstones exist with legible inscriptions prior to 1903. A list of all the burials believed to be in this cemetery is shown on a separate webpage. Information from the tombstones and from the records in the diocese archives have been merged. In addition a few records have been updated and/or corrected by relatives who have emailed. Most of the grave markers that remain are stone or cement. There are several metal crosses and all of these mark the graves of Polish immigrants. Apparently metal crosses are still a common custom in Poland. Michael Kramchynski, who was born in Poland in 1893 and immigrated with his parents and siblings in 1902 made most or all of the metal crosses in this cemetery. As is typical even today, many infants do not have marked graves. The proportion of graves marked increases with the age of the person. The Centennial Homestead Map by Richard D. Chomyn shows that the Fish Creek school (#867) was in operation from 1905 to 1962. I believe it may have also been called the Vandal School. Josephte (nee Gervais), widow of Calixte Touround who died in the 1885 battles taught there after the battle. She later married Boniface Lefort and is buried with him in the cemetery in Fish Creek. The first store in the RM was owned and operated by Joseph Branconnier in Fish Creek, beginning in 1900 (Hawrish 1967, with photo). The photo at the left is a later store, dates of operation unknown. (photographed June 2011). The original license for the Gabriel Ferry which traversed the South Saskatchewan River and connected to the Carlton Trail was obtained by Gabriel Dumont in 1877. He ran it intermittently until 1883. In 1908 the ferry was licensed to the village of Rosthern. The Saskatchewan Government took over the ferry in 1912. This location is now on Hwy 312. There was also a ferry at Fish Creek, but it is no longer in operation. The entrance to the former ferry is visible on the right side of the photo. The Saskatchewan Archives in Regina has photos of it R-A558 [1-24] and the file states 1921-1924 for these photos, so it presumably ran at least this long. Note that the land along the river was subdivided into long narrow pieces, 80 - 160 acres each. This was often done along rivers so that more settlers had river access. It was typical of the Métis river lot system that occured prior to the Dominion Land Survey in many areas. This is also sometimes called the Seigneurial system of New France. Several of these settlers are indicated as Cree FB (Cree French Breed) in the 1901 census and were found as neighboring younger men in St. Francois Xavier, Marquette, MB. There were several Fidler brothers, sons of William Fidler: Norbert, Cuthbert, Xavier, James, William and their mother Marguerite. Nearby are the brothers Pierre and Calixte Tourond, owning quarters along the coulee where the "Battle of Fish Creek" occurred in April 24, 1885. The four Métis settlers who died in this battle were Francois Boyer, Michel Desjarlais, Pierre Parenteau Jr. and Joseph Vermette. Homesteads of 160 acres or one quarter section were available for land a mile or more away from the river. Information about the homestead settlers is available at the Saskatchewan Archives in Saskatoon and Regina. There is a searchable homestead database that provides the name of the homestead applicant and the legal land description of his quarter for land homesteaded before 1930. Files for later homesteads are held in Regina and work is in progress to develop a searchable index for those files. A "Centennial Map" is available from the Fish Creek R.M. office in Wakaw that shows the first homesteader on each quarter and the dates of entry and patent, if applicable. Other landmarks, such as churches, schools, country stores, and post offices are also shown. The map was researched and designed by Richard Chomyn. It is an excellent source of information. Legal Land Description is a series of compass directions and numbers. A typical land description, still in use today is: Direction section - township - range - direction meridian. The settlement of Fish Creek was at 13-42A-2-W3. There is only a small piece of the SW quarter of this section on the east side of the South Saskatchewan River. All full townships are numbered in consecutive order from 1 in the SE corner to 36 in the NE corner. 42A is not a full township. Even numbered sections were allocated to homesteaders by quarters. The 8th section and all but the NE quarter of the 26th section were allocated to the Hudson's Bay Company. The 11th and 29 section in each township were allocated for schools, and the remaining odd numbered sections were allocated to a Canadian Railroad Company. In this area, that would be the Canadian Pacific Railway, or CPR for use in building railroad lines in some cases, but more typically for later sale to finance the building of rail lines. Some records of CPR land sales are available. Canadian Census records are available free of charge at Library and Archives Canada. Ancestry.com has also indexed these records by name and purchased the right to sell subscriptions for those indexes and other genealogical records. Many public libraries, including the Saskatoon Public Library, have subscriptions to Ancestry.com which can be used free of charge. Some early settlers are shown on the 1891 census. The 1901 census is of special interest to persons of Metis heritage because this census showed ethnicity. Cree FB was one acronym for Cree French Breed, for example. Note that Metis scrip and other documents also provide evidence of Metis heritage. [XLS 231 KB] Downloadable Formats. The first names of wives and children, along with their gender, marital status, age, and country or place of birth are also shown on the 1906 census. The last 5 columns, show their livestock as numbers of horses, milk cows, beef cows, sheep, and hogs. More information about the Canada Census records available can be found through the Canada Genealogy Centre website. The census takers typically had reasonably good penmanship. However, not all of them spelled perfectly. The census taker in 1916 was among the worst at spelling and hence the index by Ancestry.com bears little resemblance to the names of the people living there at that time! To search the Canada Census collection it is useful to know as much of the information below as possible. An example for a section including the River Lot on which Boniface Lefort lived is provided, but see the Table below for the specific year's data. Page 4 contains his family. Ancestry.com states a record page for Boniface Lefort who lived on River Lot 7 from 1883 to his death in 1944 as: 1891 Territories > Saskatchewan > Duck Lake > 11, for example. Centennial Map of the Rural Municipality of Fish Creek No. 402, Land Grant Recipients & RM Landmarks, by Richard D. Chomyn. 2005. 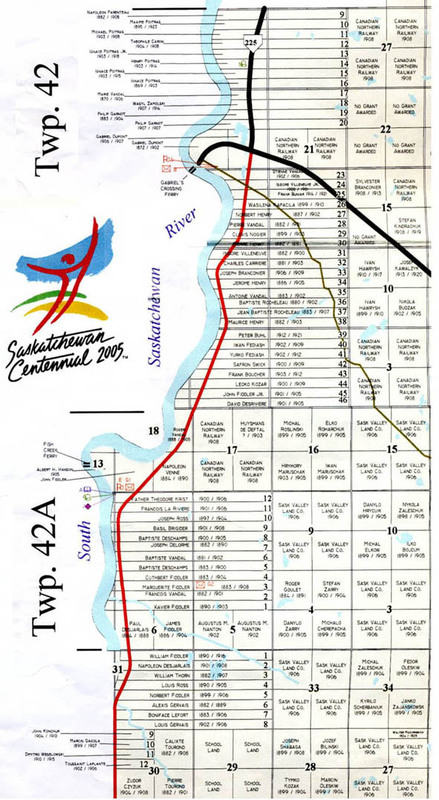 Such maps are available from the RM Office in Wakaw. Other homestead maps which do not show additional landmarks are available from the Saskatchewan Genealogy Society Library in Regina. Kaleidoscope. Many Cultures - One Faith. The Roman Catholic Diocease of Prince Albert. 1891 - 1991. 1990. Solange Lavigne. This book describes the early mission and church at Fish Creek. (available at the Saskatoon Public Library). "Veterans and Families of the 1885 Northwest Resistance" by Lawrence J. Barkwell. 2011. Gabriel Dumont Institute Publishing Division, Saskatoon. ISBN 978-1-926795-03-4 (for sale through the Gabriel Dumont Institute) Brief biographies of many people who fought or helped in the resistance which often contain genealogical information. Homestead Settlers Near Alvena, Saskatchewan, Canada A gedcom file of some early homesteaders of the Alvena and Fish Creek area, prepared by Sheila Schmutz. A searchable database by name or land location. Files held in the Saskatchewan Archives in Saskatoon and Regina. Canada Genealogy Centre Census records, searchable by land location, free of charge. 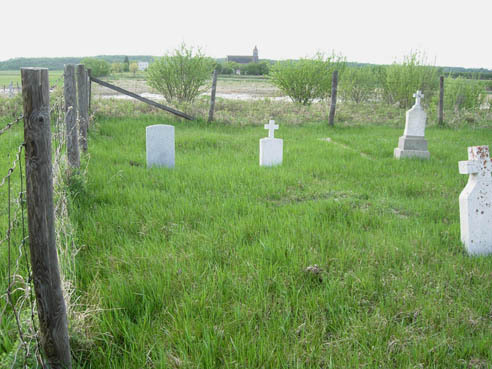 A listing of some cemetery transcriptions in Saskatchewan, organized by place and cemetery. A searchable database that allows free access to tombstone records. 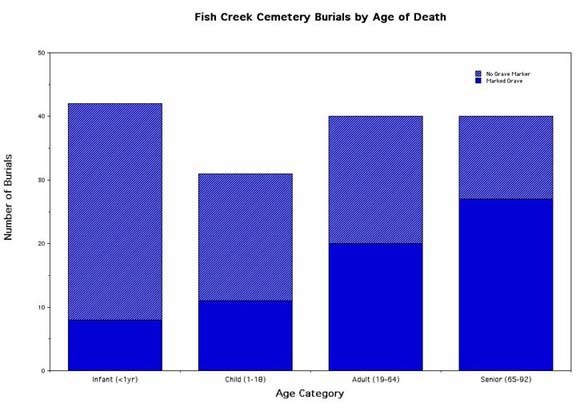 Although there are not many for Saskatchewan yet, the cemetery at Fish Creek is included. Please post a memorial note if you have further information about the person buried there, by clicking on a particular grave.